The ferraiolo is a type of cape that is worn by members of the clergy on formal, but non-liturgical occasions. The farraiolo may either be worn over or behind the shoulders. It extends to the ankles and is fastened in the front by a bow made of narrow strips of cloth. There is no trim or piping on the design. The color of the ferraiolo generally depends on the rank of the wearer. Black is reserved for secular priests, violet is for bishops and scarlet watered silk is for cardinals. Persons attached to the Papal household other than the Pope may also choose to wear scarlet. The R.J. Toomey custom made ferraiolo is purple in color and extends the full traditional length. The bishop ferraiolo is unlined and has a large flat collar that folds back over the shoulders. It's designed to be fastened at the neck with red ribbons and is made of durable and easy to clean 100 percent woven polyester. The ferraiolo is available in one size to fit most wearers. 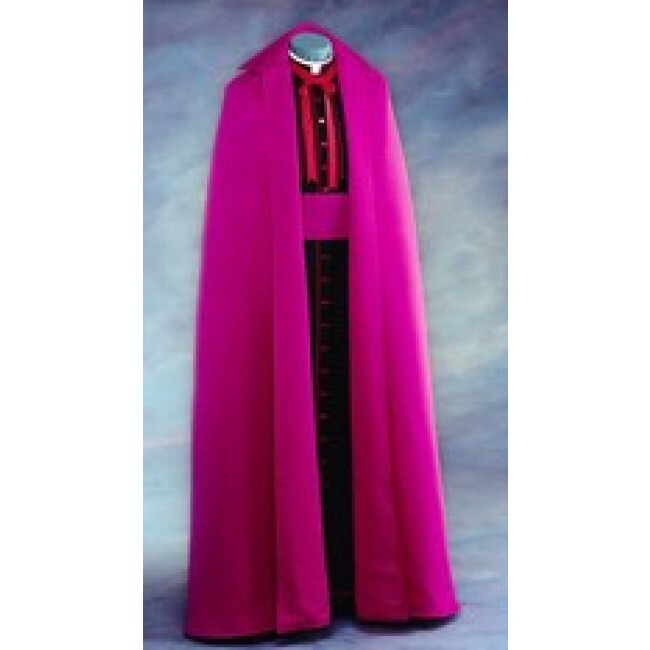 The custom made design is produced by the R.J. Toomey Company, who is known for making high-quality religious vestments that look great and last for years to come. Feel free to contact our customer service department for questions about sizing and availability.